Henry Johnson was a World War I hero because of his remarkable performance in France. Johnson, born in 1897 in Winston-Salem, North Carolina, moved to Albany, New York with his family when he was still a child. At the age of 20, he worked as a “Red-cap” porter at the Albany train station. On June 5th of that year, however, he joined the U.S. Army and was eventually assigned to the all-black New York 369th Infantry Regiment, better known as the “Harlem Hellfighters.” Nearly four months into his Army enlistment, Johnson married Georgia Edna Jackson of Great Barrington, Massachusetts on September 17, 1917. Johnson and the other troops were trained in segregated Camp Wadsworth, South Carolina. On January 1, 1918, the unit arrived in Brest, France and at first were used as laborers and stevedores. By mid-March the 369th was sent to the front and attached to the 16th Division of the French Army. On May 1, 1918, Johnson was promoted to sergeant. Fourteen days later, on the night of May 14, Henry Johnson and Needham Roberts were assigned to sentry duty at a bridge held by U.S. forces. They were ambushed by a 20 soldier German Army raiding party. Although Roberts was initially taken prisoner, Johnson killed four German soldiers in hand-to-hand combat, wounded twenty others and rescued Roberts. His stubborn defense of the bridge sent the other German soldiers into retreat. After this skirmish, which was soon dubbed the “Battle of Henry Johnson,” it was discovered that the sergeant was wounded 21 times. He was treated in a French hospital for bayonet wounds in the back, stabs on the left arm, and knife cuts on the face and lips. Johnson was awarded the Croix de Guerre, France’s highest military honor, becoming the first enlisted American soldier to win the medal. Henry Johnson went home a hero of World War I. 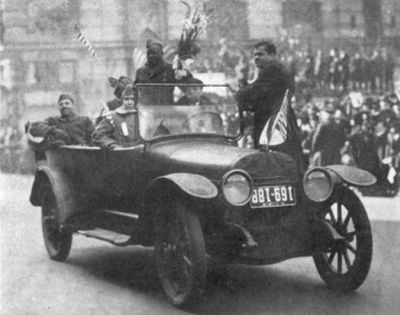 Discharged on February 14, 1919, he and the 369th received a tumultuous welcome when they paraded up New York City’s Fifth Avenue to Harlem. Johnson was personally greeted by New York Governor Alfred E. Smith and other officials when his train arrived in Albany. Despite the hero’s welcome, which included discussions of a movie contract and proposals to name a street after him, Johnson, who was permanently disabled by his wounds, was never able to fully support himself in post-World War I America. In 1923 he and his wife divorced. Denied work and without a pension, Johnson became an alcoholic and died impoverished and alone at the age of 32 in New York City on July 2, 1929. He was, however, buried with full military honors in the Arlington National Cemetery just outside Washington, D.C.
On July 25, 1996 the U.S. Army posthumously awarded Johnson a Purple Heart for his battle wounds. Six years later, on March 19, 2002, he was awarded the Distinguished Service Cross for bravery. Gail Buckley, American Patriots: The Story of Blacks in the Military from the Revolution to Desert Storm (New York: Random House, 2001); Richard Slotkin, Lost Battalions: The Great Way and the Crisis of American Nationality (New York: Henry Holt and Company, 2005). American Nationality (New York: Henry Holt and Company, 2005).